I'm really looking forward to playing those games! Very nice reference sheets, D-Rock. Nice draw, Mistacheeeez. Cute draws of your fursona, Jolty-Kun. Great work with those, Hukley. Followed a tutorial I found to get this. Working on color schemes for Portal!Jolty. Here's one I particularly like. Greys and greens, somber yet somehow conveying a certain strength, dark but vivid. People often ask Jolty why he is always wearing long pants, and shoes. Well, this is why. More art. I plan on doing more than just Jolty, don't worry. I actually plan on making a few comics for my story, in like, intervals? Just nonsense adventures, mostly. But here, have a cool looking Jolty. Story behind this: So today I was digging through old folders from the beginning of my art career. And I found a drawing of the original characters from my first real story, besides "Owsald" (I misspelled his name on the original, so I did again for old times sake. His real name is Oswald. 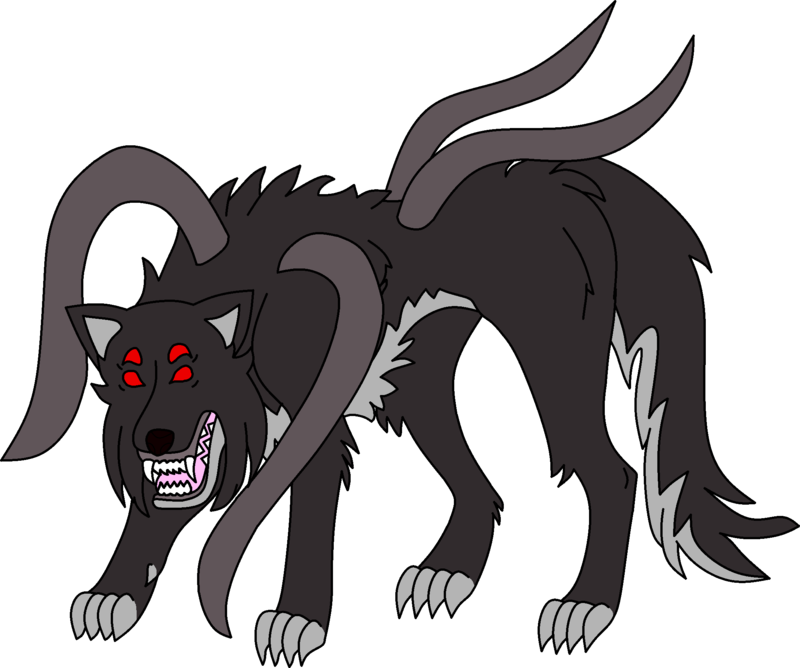 ), who is a variant of SCP-999, back when I was thinking about being a furry, but not quite sure. I redrew it, and am very satisfied with the result. Hope you all like it! 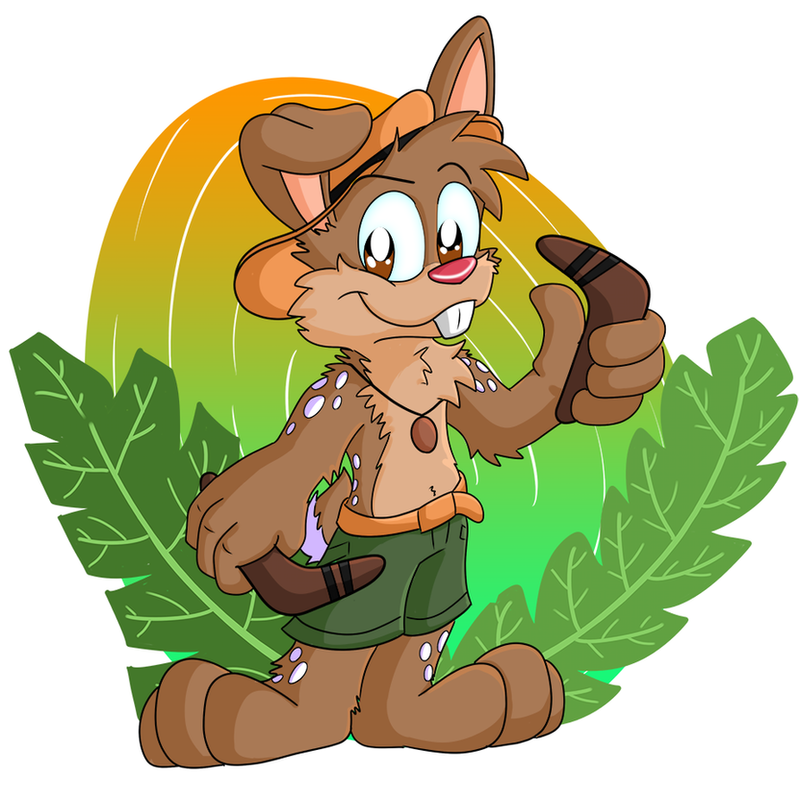 A little picture for Hlaoroo he changed his quoll into a bunny for this week. Is he a bunnuoll, or a quonny? His hands looks also pretty big, and they're perfect to catch boomerangs, indeed. Nice idea, Furr, and good job as usual, Hukley. Nice draws of your character, Jolty-Kun, but I wonder, and I don't know if you've ever explained that, why the 6 fingers per hand? I made my fursona in a battle, with his favorite weapon, a staff. Dynamic ... even with goggles! Never realized how weird open mouths can be to draw until I actually looked at this. Here's a sketch of D-Rock's character, Macabre. I know it's a bit off model, but I've been tinkering a bit with different art styles. Looks amazing, man! Thanks for drawing him! I'm really glad you like it. I like Macabre, especially his taste in classical music. 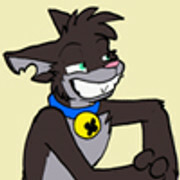 Also, I agree that open anthro dog mouths are a bit awkward to draw, but I think you did a good job on your character. Thanks! Hopefully I'll eventually move up to free-handing that. 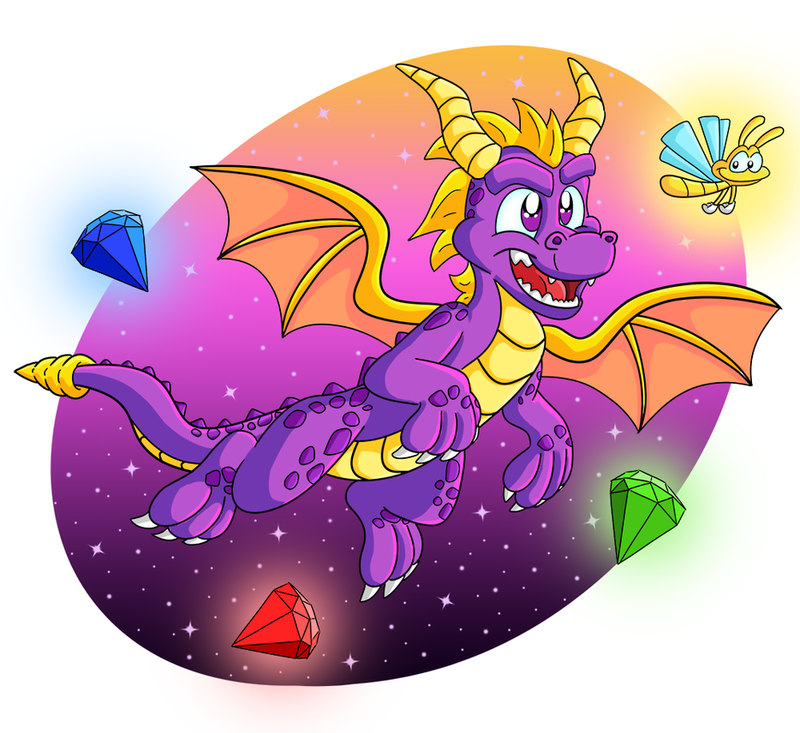 That's really good dryideabat, much better than I can do! Always look to see what Jolty'd drawwing .. Oh, and I seriously like your depiction of Macabre, drydeabat! Intriguing and sinister. More study hall sketches. One is of full grown Lionel, in his usual outfit, and the second one is of the twins at around age 8ish. They recieved gifts from their owner's parents (Whom they call Grandma and Grandpa). Grandpa North gave them his old Fedora, which Leo took, and his old dress coat, which Jolty took. Obviously they are way to big on them at this point in time, but they'll grow. Very nice draws of your character, Jolty-Kun. It's bad for the missing arm of that puppy, and it's curious for the polydactyl of your fursona. Nice draws, D-Rock and Nicholas. Colored in Bat's sketch, with his permission. This was a lot less tedious to do than I imagined. Thanks, again! What do you guys think? Any words of wisdom? mine has changed a few times, from dog to tiger to hawk to pegasus pony to panther to coati, but I've always kept the colors the same; black with blue and white highlights, dressed in red and purple. I find having some part of it that stays the same helps maintain a sense of 'this is me'. it doesn't necessarily have to be the colors, it can be anything. Well, I'll probably always be a cat with six fingers and glasses, just my colors would be changing. I'm not sure. I just have been a snow leopard for so long I am not sure. I still feel connected. Nice work coloring it, D-Rock! It must have taken a lot of work with the low-quality picture from my phone (my apologies for that. I still don't have easy access to a scanner). Would Macabre be one to play something like All Gone (No Escape) from The Last of Us, or is he strictly old classical pieces? rocky's never struck me as one to be constrained by whats conventional, so maybe his characters aren't either? Macabre has a deep love for the classics, but he will go on other genres. I easily envision him playing what Buster posted. Also violinists like Lindsey Stirling. Great original tracks and covers of songs like Boulevard of Broken Dreams and My Immortal. And even found this. Skillet also has some occasional violin pieces on their music. I made him a pretty general player in regards to his tastes. As for the actual sketch, it wasn't that difficult, really. Trust me, I've worked with worse. And Jolty, nothing wrong with experimenting with a new character. Give it a shot if you want, and see if you like it. Even if you don't feel it, maybe you got yourself a new OC. My gosh, saving that video. Oh, and thanks D-rock, and Buster. I will try it out for a bit, see how I enjoy it. Forgot to post these here. More characters I drew up a while ago. ...Harriet is actually a pretty bad attempt. Far from mastering dog or cat models, and attempted other animal types. Priorities, people! The new design for my character. May improve some more later. Also, have Troll!Grape meme too. Ah, it's okay. I didn't even think of that until now.